Oh, so there you are! The Spring and Fall are the best seasons to walk along my life long favorite trails. This evening it was the Highline Canal Trail. I’ve walked this trail since, well, since I could walk. 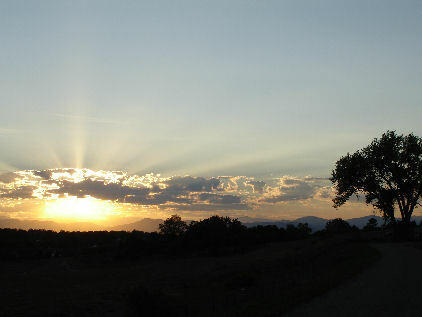 It’s evening walks like these, alone with my thoughts, that I feel I could never live anywhere but Colorado. But the walks are changing. Deep gashes are being hacked out of the land on either side of the trail to build colossal, five story buildings some people seem to need. Stranger still, they call them “homes.” Thankfully, they haven’t rubbed out nature yet. As I walk, I can close my eyes and listen to the cicada and crickets, smell the woody fragrance of the aging cottonwoods and maturing sage and yarrow. Fall is imminent. When the breeze is just right, and the failing sunlight just so, I can even imagine Janet is walking along with me. At this moment, it would take a powerful force to pull me away from here. I feel the roots fading, however, as places exist in both space and time. The relaxing satisfaction of watching a sunset has been displaced by a deep sadness I cannot define just now. It’s a silence that has me listening for something. My sense is there will be a time when I must go and search for a new home. Grammar changes and expanded a few ideas. It may seem incongruous to associate the word “Peace” with “Warrior,” but as history has shown and current events are testing, there can be no peace without warriors to protect it. Janet was such a warrior. She knew peace, how to create it, how to nurture it and she knew when to defend it. And there is no denying she knew how to fight. When breast cancer showed as an opponent, she knew most likely she was fighting for others, that they might have a chance at peace. A peace that she would not know again until she left this world. I had one last obligation to Janet’s physical presence here on Earth. It was her wish that her ashes be laid to rest in Hawai`i. Janet and I had a number of conversations about what she wished to have happen in this matter. And I have had a year to come to terms with this transition and to think about what needed to be accomplished during this particular journey to Hawai`i, for both Janet and myself. I have a clear sense of peace that I was successful. A few were released at a brief ceremony on the Heiau where we were married. I had devised a special urn for the Heiau ceremony and called it Janet’s hōkū lele (Hawaiian for “shooting” star or “meteor”). My role in this ceremony was to facilitate the completion of her transition from life on Earth to what Janet believed was the next phase in her spiritual growth. I do not know what was next for Janet. None of us can claim that knowledge. What I do know is what she believed needed to happen on this side of her transition. As anyone who knew Janet could attest, she could be rather particular and in this matter she was no different. She was adamant, for instance, that at least 72 hours pass before her cremation. And so it was. Most of what needed to be done has already been taken care of by Janet herself. My part, while perhaps important, is largely symbolic and pertains to her actual physical remains. Transition of Heaven was completed by Janet on April 22, 2005. She referred to this as her transition into Spirit. Likewise, the transition of Fire has been completed. No one can deny that Janet walked through the most intense of fires during her 10 year battle with breast cancer. Then, of course, there was her cremation. That leaves the transition of Janet’s remains to Earth, Wind and Water. Here, I have a minor role to play and larger forces will see to the completion of transitioning these elements – the Earth, the Wind and the Ocean. In summary, the Heiau ceremony went as follows. I met with Fern Merle-Jones from Island Weddings and Blessings at the Kalalau trail head about mid-morning. I was delighted to see she was accompanied by four other Hula dancers, including Eana Rose who had recommended I contact Fern for the celebration arrangements. I have previously posted the rather interesting chain of events leading to my introduction to Eana. As we began the short hike up to the Heiau, several of the dancers began to chant in Hawaiian. Thank you each for being here with me to participate in and witness the completion of Janet’s transition and to celebrate her life. The voyage Janet and I shared began on this sacred ground. We were married here. And here, on this same ground, this familiar landscape where we vowed tell death do us part, we do so today. Each on separate journeys, each with new eyes. Janet had a profound respect and appreciation for sacred places. Her skill at creating such places was unparalleled. She would have begun this ceremony by calling in the light and that is what I will do my best to accomplish now. I ask that you surround each and everyone here with the Light of Aloha for the highest good. A Warrior of Peace comes to you swift as an arrow shot into the sun. I knew her as Janet Laurel. Please accept her. Fern then lead the dancers in two absolutely beautiful dances for Janet. One of the reasons I think Hula appeals to me so much occurred to me while watching. I thought of Fred Astair, and watching him from an Aikido perspective – he is incredibly balanced and centered. I can see this when watching a single Hula dancer, but the really amazing experience happens if you can view all the dancers simultaneously with soft eyes and absorb the story they are telling as a group. Its like seeing the forest in the trees. Not easy, but its very cool when it happens. The five dancers assembled for Janet’s Heiau celebration were excellent and did a wonderful service for her transition. It was my turn to complete the ceremony with the hōkū lele. As I spoke the words returning Janet’s remains to the Earth, I tapped the hōkū lele on the stones at the edge of the Heiau to release a few of her ashes onto the ground. As I spoke the words returning Janet’s remains to the Wind, I held the hōkū lele high and shook it to release a few of her ashes onto the sea breeze blowing up from off the waves below the Heiau. After I spoke the words returning Janet’s remains to the Water, I held the string tail to the hōkū lele tight and wound up for the best shooting star I could muster and launched it far out over the edge of the Heiau and into the waiting Ocean below. The holes in one half of the hōkū lele would allow for Janet’s ashes to be released into the Ocean’s water. The Colorado granite stones and Anini Beach sand would insure the sphere would sink and not wash up on some beach for a tourist to find and pocket as a souvenir. The Colorado granite stones also provide a symbolic link back to another part of the world that Janet loved so much. In short order the glue (water soluble and non-toxic, of course) holding the hōkū lele together would dissolve and spill any stones, sand and remaining ash into the Ocean. Over a short period of time,the wood and cotton string would degrade, thus leaving no trace to its purpose. Before we left the Heiau, Fern again blew the conch shell several times. At the base of the trail leading up to the Heiau, I walked out onto the rocks at the end of Ke`e Beach and threw the leis into the Ocean while the Hula dancers chanted. I ended up with a full 3 hours by my self at the falls before anybody else arrived. While soaking my sore feet in the cool water, I noticed I wasn’t alone. An `Auku`u (Black-crowned Night Heron, native to the Hawaiian Islands) was across the way, intent on some fishing. `Auku`u, while belonging to the same family as the ubiquitous cattle egrets found on the Islands, are quite rare and don’t care for the company of humans generally. I’ve been fortunate in that for some reason they tend to find me or when I stumble upon them then don’t fly away. This has been true of the Great Blue Herons back in Colorado as well. Janet used to marvel at my affinity for birds in general and herons in particular. She decided they were somehow my protectors or guardian angels. Perhaps. I just think they are magnificent creatures and I tap into a deeper sense of peace and confidence whenever I am near one. I moved in a little closer and got a pretty good picture. We hung together for about 15 minutes during which time he caught two pretty good sized fish. Then with a magnificant spread of wings, he caught the draft of wind coming off the falls and sailed effortlessly down the valley. Can you find him in this picture? And of course, the falls were as magnificent, inspiring, healing and replenishing as ever. View from the ledge. View of the ledge. Back out at Hanakapiai Beach, it was an opportunity to experience some excellent, thunderous wave action. The surf is still really rough and the rip tides looked particularly vicious. The last of Janet’s ashes were laid to rest on top of Haleakala on Maui. Haleakala means “House of the Sun,” and is the place where the Hawaiian God Maui captured the Sun and brought it to Earth. Fitting, as Janet was certainly my sunshine, and my star to steer by. I made the trek to the top of Haleakala well before sunrise, carrying the last of Janet’s remains. Finding a suitable place to sit in the dark wasn’t particularly easy, but find it I did. Looking to the horizon I could see the faintest hint of the new day begin to color the edge between Heaven and Earth. Time to wait. And remember. Janet was fighting cancer barely three years into our marriage. Most days, I have to struggle to remember what it was like to be married to someone who didn’t have cancer. I thought of all the hopes and dreams we had on our wedding day – thoughts of children, family, friends, laughter, flowers, travel, music, writing – the images were rich and endless. Somehow, they didn’t seem to belong to me anymore. They weren’t mine to share with Janet. Our time together was for a different purpose. On top of the world, surrounded by an Ocean of tears, there was no need to cry. What was my sorrow when compared to all those who have suffered before me or were suffering now? Since Janet’s death, I, too, have added tears to this Ocean and so have come to understand a greater depth to loss, courage, power and love. My life with Janet expanded my experience of what it means to care, trust and understand. So how shall I apply the gifts Janet has left me? How shall I and the world gain by this loss? This, it seems, shall be my koan into the next moment. The very first rays of sunlight were dancing with the cloud tops when I released the last of Janet’s ashes onto a wide flat stone in front of me. 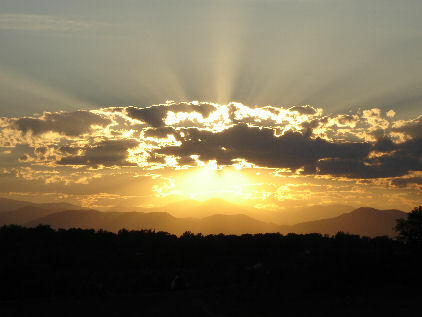 The wind had picked up and immediately began to carry her off to greet the rising Sun. Looking out across the vast panorama of volcanic ash, the thought occurred to me, “ashes to ashes, sure enough” and I wondered what magnificent Phoenix would rise from this humble collection of dust. 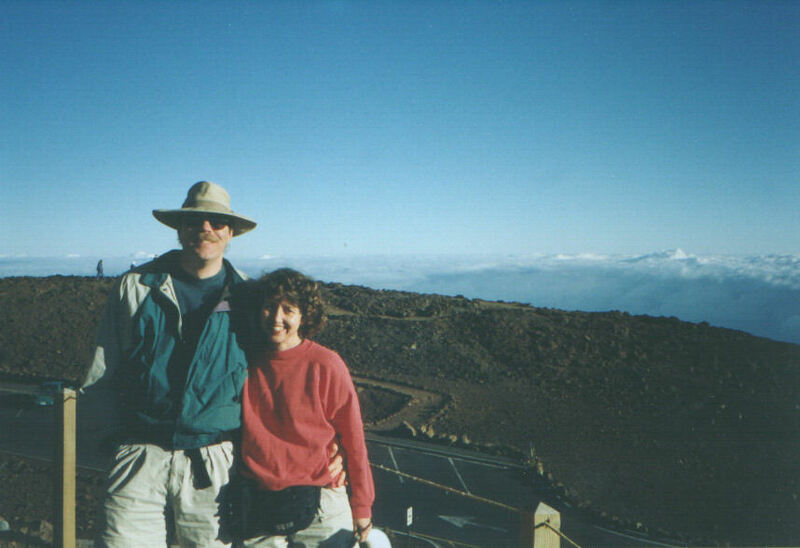 I rested there on the top of Haleakala, watching the wind carry away Janet’s remains into the morning sunrise. I was remembering the last words I said to her for which I know she acknowledged having heard. “Peace be the Journey”, I said, and she nodded. I looked down to the wedding ring on my hand. The ring Janet put there close to 15 years ago and during that time had never once left my hand. The ring inscribed with our wedding date and the simple phrase “With Loving” – our affirmation and promise to each other, our challenge to fulfill each day. For thirteen months I could not bring myself to remove this ring. I have continued to feel like I am still married. Where can I place the experience of 14 years with Janet? “Until death do us part” turns out not to be true. I can never leave her behind and yet what is there to carry forward? Part of me died with Janet and part of her lives on with me. I cannot stay and I do not want to go. This was the void feared for so long and I had arrived at the trailing edge of that unthinkable moment. I said the words aloud, “With Loving,” to be carried away by the wind along with the last of Janet’s ashes. As I watched the barest trace of ash left upon the windswept stone in front of me disappear, I slipped the ring from my finger and shifted my gaze to the horizon. I had thought of this simple, yet powerful expression while reflecting atop Haleakala. Indeed, it is our poets and composers who best speak for us when we are struck dumb with grief and sorrow. 1From the crown of the head to the soles of the feet and the four corners of the body. A call to be mindful of one’s entire being- spiritual, mental and physical. 2Love gives life within. Until we meet again, Precious Janet. …and loving you truly, madly, deeply. Rest is at hand, Makamae Janet. 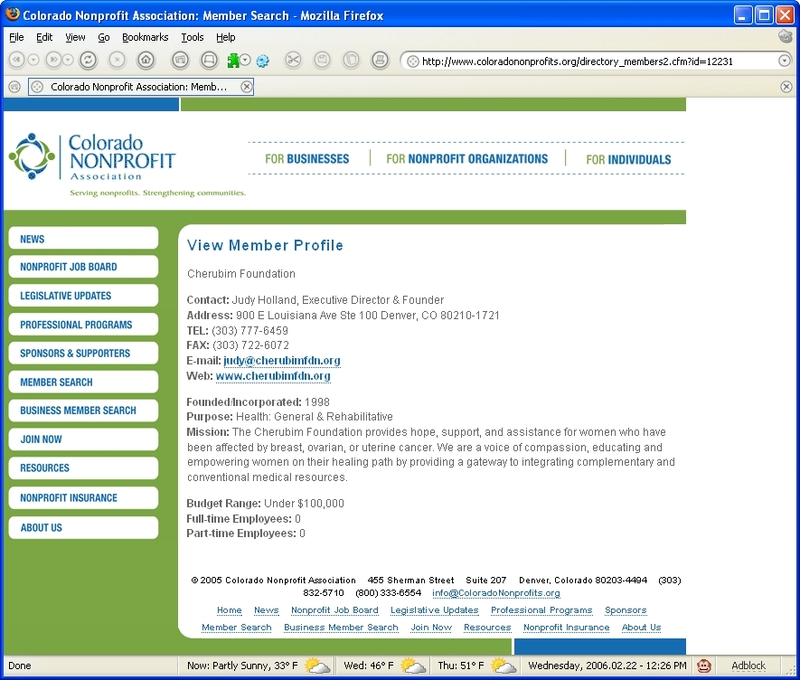 2006.06.23 – Added link to The Warrior of Peace Rests. “It is…due to circumstance beyond our control that Cherubim Foundation is closing it’s doors,” begins a letter to donors from the Unfounding Board of Directors for Cherubim Foundation. I haven’t received this letter. It was sent forward by a friend who did. So far no one in my family or Janet’s family received the letter. Apparently what we did wasn’t worth recognizing and thousands of dollars donated over the years doesn’t count. Whatever. I knew the Board had handed Judy Holland unprecedented powers as part of their feeble efforts to find an Executive Director, but this is unbelievable. 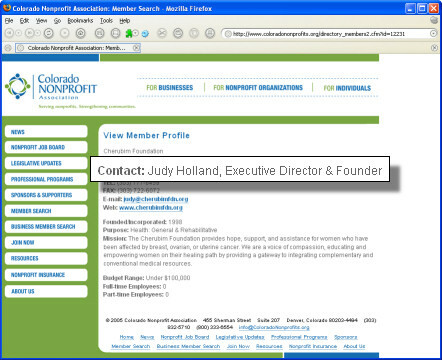 Ms. Holland is listed as Cherubim Foundation’s Founder on the Colorado Nonprofit Association’s web site (original screen capture here), presumably for the past 8 months. I noted previously they seemed to loose track of when Janet actually passed away. But to loose track of who actually founded the organization? A lot of people are owed an apology. Wow. I have begun work to codify the business model which had proven successful for the first six years of Cherubim Foundation’s existence but elusive to new members of the organization. This will include components that worked, triage of those that didn’t and possible remedies to those weaknesses. Clearly, Cherubim Foundation’s transformation since Janet’s passing has exposed many of these weaknesses and as such will provide valuable insight into strengthening the business model. This will likely take a while as there is considerable material to work through. With plans to release under a Creative Commons license, I anticipate having a first draft ready for public review late in 2006. It is likely that at about the same time I’ll make a determination on whether or not to start a new organization in line with the vision Janet and I held for Cherubim Foundation. Meanwhile, it seems the Board of Directors for Cherubim Foundation isn’t interested in taking responsibility for their decisions or answering questions. They wouldn’t do it privately and they’re not going to do it publicly. They’re quitting. Funny, the Board builds a wall while I press for answers until I’m spent. Tape a weblog note on the window to the world and the whole thing collapses. When it was eight fending off one lone voice of concern it was no doubt easy to wrap themselves in patronizing platitudes. How things change when it becomes eight against hundreds. Thank you all for your support. Since I was about age 10, I though the cello would be the coolest instrument to play. Thirty four years later that hunch is confirmed. I’ve started playing cello and it is cool. Its like giving music a hug. Had my first lesson a little less than 3 months ago. Before that I hadn’t so much as touched a cello. I’m certain Janet and my friend Reed Bernstein (a violin maker) were the only people who ever knew of this secret ambition. Janet and I talked on occasion about finding a cello, but the opportunity never happened. I have played piano for many years and own a beautiful Petrof baby grand. Unlike piano, the cello is demanding a far greater awareness of my entire body while playing. The balance required is surprising and it makes the skill of such masters as Yo Yo Ma and Pablo Casals all the more amazing. All those years of piano and I never learned to read music and play anything I wanted at the keyboard on sight. I’d have to pick through the score and iteratively practice until the entire piece was committed to memory. With cello, I have the opportunity to do that differently. After about 3 months of lessons, diligent practice and efforts to read music while playing, the experience just keeps getting better. My teacher is excellent. A cellist for the Colorado Symphony Orchestra, she fits my criteria for having attained a level of recognized mastery. She’s good with adults as well, another important criteria. It must be more challenging to teach adults as there are bunches of things which we must unlearn before new lessons and understanding can result. About a month into my practice (I’ll give myself 10 years and then decide if I have a chance at being any good.) I hit my first plateau and wasn’t sure if it was related to my clumsy technique or the quality of the cello, a high school orchestra quality instrument borrowed from my neighbor while he and his family spend a year in France. My teacher suggested we find out and handed me one of her cellos (as a professional, she has cello stuff about the place like I have computer stuff). WOW! What a difference! Yes my technique had a part, but so did the instrument. She handed me another cello, “Try this one.” DOUBLE WOW! The good news was that my technique wasn’t so far off the mark and I had already begun to outgrow the loaner instrument after one month. The bad news was the first cello I tried was a 50 year old Italian cello worth $25,000. The second cello was a 100 year old Czech instrument worth bunches more. Ouch. We talked about what it would take to acquire an instrument which would suit my emerging skill for the next couple of years. So I hooked up with a recommended broker and settled on a $5,000 instrument made last year. It sounds wonderful! Included a better bow in the mix as well. I figured to use the money from a small life insurance policy I had on Janet to finance my studies and cello upgrades. Seems like a good use and a way to honor her musical talents. Someone sent along a copy of the new brochure for Cherubim Foundation. Is anyone in the office proofreading? Are they paying attention to any details? Janet died in April, folks. It also incorrectly lists Fresh Squeezed Books as supporting the organization. Fresh Squeezed Books does not support Cherubim Foundation. 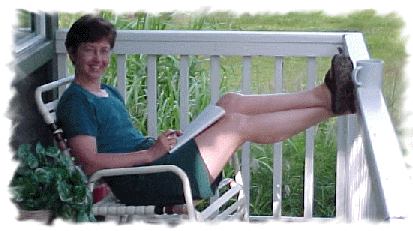 2006.02.22 – A printing of this brochure from a month earlier actually had the correct date for Janet’s passing. The incorrect date was an intentionally modification. The first printing had its own problems, however, including trademarked material belonging to another organization used without permission. Hence the second printing. I’d like to start with a brief measure of your moral and ethical fortitude. Imagine you are coming out of a store and you see a car pull out of a parking space and smash into another car. You watch as the car drives away, making note of the offending driver’s easy to remember vanity license plate. As far as you know, you are the only one to have witnessed this accident. How would you respond? Would you call the police? Leave a note on the damaged car? Or would you just get on with your life and not get involved? Image the same story, except you recognize the damaged car as belonging to a friend you had met while shopping. Now what would you do? Your response to these scenarios will help put what follows in context. I wanted to write about Janet’s last few days before the memories fade like delicate colors in the sun or the edges of objects in waining daylight. This post has been in draft mode for several months, undergone numerous revisions and will likely be revised again as I remember various points. During the week Janet was in hospice, she said on three separate occasions “I want to go.” What an incredible forward looking statement. It wasn’t “I want to die.” or “I’m ready to die.” It was “I want to go.” The day before she died, she said “I want to go before they get here.”, referring to the impending visit by some of her family and out-of-town friends. Hello and thank you for being here. Here we are, gathered together to celebrate a life over 51 years in the making. Like a fine quilt, its a life woven by a master’s hand from many threads that together tell a rich story. Each of us represents one of those threads. Some long, some short, each a different color and part of a different story. Ask anyone here about how they know Janet and you shall hear those stories. Companion, confidant, best of friends, beloved wife, and soul partner. Godspeed, my love. Peace be the journey. I miss you.